'Walks of Design' exhibition at B&B Italia on Via Durini, featuring new designs by Antonio Citterio, Naoto Fukasawa, Piero Lissoni and Michael Anastassiades. As day one of Milan Design Week unfolded across the city, the design industry unveiled exhibitions, talks and art installations that this year echoed the Salone del Mobile’s first manifesto, calling for the design industry to champion innovation and sustainability. Perhaps not a new take on what designers and brands traditionally offer up, but certainly the first time the organisers have announced an encapsulating theme for the week. In the courtyard of Palazzo Isimbardi, close to the famous Villa Necchi Campiglio (also worth a visit), Swedish fashion brand Cos followed up their last two design collaborations, with Sou Fujimoto and Studio Swine, to reveal another immersive piece This time a large, faceted wall of mirrors designed by American artist Phillip K. Smith III was installed in the courtyard of the palazzo to reflect the Milanese sky and the city’s 16th century Italian Renaissance architecture. Somewhat reflective also of the multi-layered gaze the week demands of its visitors. The SP01 installation is defined by warm colours, fine detailing and luxurious materials. Visiting the Australian brand SP01 and their main show at Via Tortona 31 – the other is the satellite show with Tom Fereday as part of Local Milan No. 3 we will feature later in the week – there were new releases, including the freshly launched Tim Rundle collection that celebrates delicate details, simplicity and refinement, along with new pieces for both the indoor and outdoor collections, and a sneak preview of a new storage collection by Metrica. The London-based industrial designer Tim Rundle has defined his new collection for SP01 with a rich palette of materials, including marble, luxurious fabrics and metallic finishes. The Tim Rundle collection for SP01 feature the Anita Rod base armchairs in luscious dusty pink velvet and saffron upholstery. Cassina showed at their newly renovated Milan headquarters redesigned by art director Patricia Urquiola – fifty years after it first opened and following a roll call of design heavyweights, including Mario Bellini, Vico Magistretti, Achille Castiglioni and Piero Lissoni, who have all interpreted the space over the past five decades. Patricia Urquiola’s eye for colour, detail and materiality, has transformed the old interior with a contemporary take on the building's classical architecture. Highlights from the new collection include the Bowy sofa by Patricia Urquiola. The new Bowy sofa by Patricia Urquiola, and a range of complementary tables in high gloss earthy reds and cobalt blue. B&B Italia's new chaise designed by Piero Lissoni. B&B Italia launched the 'Walks of Design’ exhibition at their store on Via Durini, a show focused on the home and new projects designed by Antonio Citterio, Naoto Fukasawa, Piero Lissoni, and, for the first time, Michael Anastassiades. One of the key pieces is the new chaise (pictured, left) designed by Piero Lissoni that is both sculptual and comfortable. Vogue Italia’s 'Life In Vogue' exhibit celebrated the Milan Furniture Fair and the relaunch of the Vogue Casa supplement. It is a week editor-in-chief Emanuele Farneti describes as "probably the most important, interesting week for Milano after fashion week". The magazine asked eight furniture designers to reimagine the Vogue office. 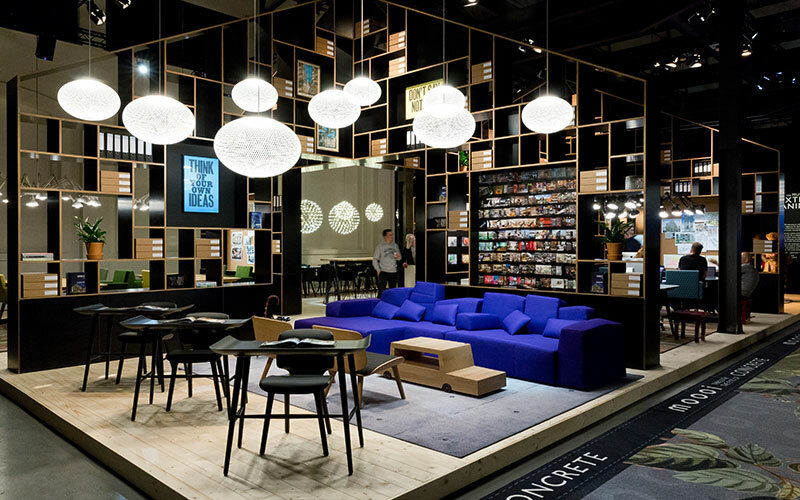 with input from fruniture brands including B&B Italia. 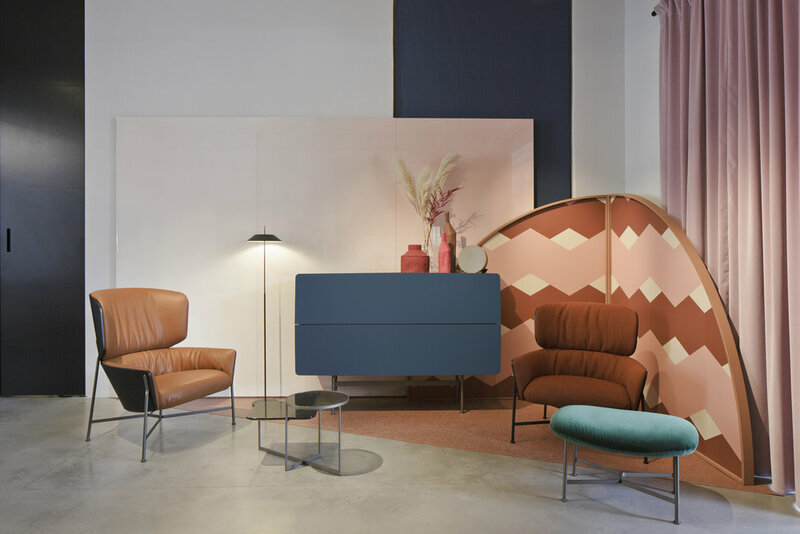 The designers involved included Mario Bellini, Patricia Urquiola, Antonio Citterio and Patricia Viel, alongside the next generation of talent incluidng Muller Van Severen, Sabine Marcelis, Michael Bargo, and David Lopez Quincoces and Fanny Bauer Grung of Quincoces-Dragò. The exhibiton explores ideas that bridge both past and future of the media empire as it juggles between platforms that connect both off and online. Moooi's Mega Chandelier by Moooi Works takes centre stage at their 'A Life Extraordinary’ show. Moooi's Marcel Wanders outside the Moooi installations at Via Savona, 56 in Milan. Moooi showed three exhibitions under one roof – 'A Life Extraordinary', an exhibition of new designs and product extensions experienced alongside much-loved novelties; 'Moooi Through the Eyes of…’, an installation by interior designer Megan Grehl and Concrete Architectural Associates, who created two very different interiors, each one showing just how flexible the Moooi collection is; and 'The Museum of Extinct Animals’ that features textures, shapes and patterns to celebrate and raise awareness of the importance diversity holds in nature. In a big year for Moooi, new works included 40 Winks' by IDEO and Marcel Wanders, Liberty Lounger by Atelier Van Lieshout, Something Like This Sofa by Maarten Baas, Obon tables by Simone Bonanni, and the lighting Mega Chandelier by Moooi Works, Chalice Metallic Grey by Edward van Vlietand and the Coppélia Suspended Black by Arihiro Miyake. Plus new Wallcovering by Arte and Extinct Animal Fabrics by the Moooi team. Inside the Cassina showroom redesigned by art director Patricia Urquiola. Antonio Citterio at the B&B Italia showroom looking happy on day one of Milan Design Week. Celebrating their 120th birthday, Italian brand Giorgetti showed with equal measures Milanese tradition and innovation. They also have a new identity that commemorates the group's Made in Italy craftsmanship and the clean aesthetic of the company's collections. Showing again at the elegant Giorgetti Apartment in central Milan, the collection featured in a series of rooms with classic Milanese detailing in response to a sophisticated collection of dining, sofa, armchair and bedroom ranges. And in a first for Milan Design Week, trend forecaster and design industry heavyweight, Li Edelkoort, collaborated with Google in the technology group’s first foray into the design industry’s week of weeks (and it won't be their last). In a play on words, the 'Softwear' exhibition investigates how electronic devices of the future could become more tactile. 'Softwear' launched at Spazio Rosanna Orlandi and to accompany the show, and reveal the ideas behind its curatorial approach as well as the research currently underway at organisations including Google, Dezeen magazine set up a live stream interview with Google Hardware's head of design Ivy Ross, trend forecaster Li Edelkoort, and co-founder of the Future Laboratory Martin Raymond, to discuss the way technology can, and should, better integrate with people's lives. The full discussion is posted below. more space will be back tomorrow with news from day two of Milan Design Week. Below are all the highlights from day one – all images by Space Furniture's photographer on the ground in Milan, Filippo Bamberghi.